The upward movement of the platform causes the body to accelerate upwards. Imagine the example of standing in an elevator. If the elevator was to move downwards at high speed it would make you feel light, almost like floating. If however it suddenly slowed to a stop and immediately moved upwards with rapidly increasing speed it would feel like your body just became a lot heavier and you would have to push down with your legs to keep yourself upright. With a high frequency (eg. 28Hz) to create rapid movement and a high amplitude (eg. 11mm) to create a sufficient amount of movement, Whole Body Vibration creates an effect similar to the elevator moving upwards, it's as if your body just became a lot heavier. You feel this acceleration as a force on your body, a force called G-force which is adding to the force of gravity pulling you toward the Earth. Because of this additional gravitational load, your muscles have to work harder to keep you upright. When a Whole Body Vibration machine can generate a high degree of G-force using frequencies close to 30Hz you get the additional effect of stretch reflex muscle activation resulting in your muscles working hard without you actually having to try; the machine is doing the work for you. There are two predominant types of vibration platform used in Whole Body Vibration exercise, Pivotal and Lineal. For these reasons and others Hypervibe chooses to use a Pivotal platform for its vibration machines. 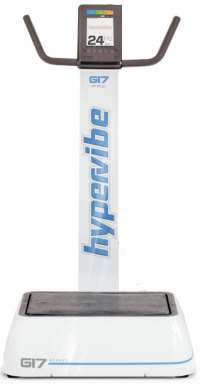 Hypervibe is one of very few Whole Body Vibration companies who have their vibration machines tested by independent engineers to verify the machines can produce the impressive output claimed. Pivotal and Lineal, What's The Difference? In Pivotal vibration machines, the platform you stand on tilts around a central pivot point like a see-saw. The left and right sides alternate up and down while the centre remains fixed. You can change the total distance your feet move up and down (other terms include 'displacement'and 'peak-to-peak amplitude') by moving them either closer or further away from the centre. The maximum possible distance varies from one machine to another but most are generally close to 10mm. The movement mimics the natural rotation of the hips during walking and running which may activate a greater range of muscles and reduce vibration that occurs in the head. The side to side alternating movement allows greater transmission of vibration energy at higher amplitudes. In other words - it generates more muscle stimulation when compared to a Lineal platform operating at the same frequency. During upper body exercises it is generally more comfortable for the hands if they are placed close together near the centre of the platform where the amount of movement is minimal, particularly when higher frequencies are being used. With a Lineal platform, hand position is less restricted as the amount of movement is the same at every point on the platform surface. A Lineal vibration platform remains horizontal at all times with the entire platform moving up and down by the same amount. Lineal vibration platforms typically have small peak-to-peak Amplitudes of 2mm or less. Some have multiple amplitude settings eg. low (1mm) or high (2mm). Due to the platform moving the same small amount no matter where you make contact with it, upper body exercises will be just as comfortable with a wide hand position as they will with a narrow one. Lineal platforms have mechanical limitations that prevent them delivering the same natural pelvic movement or intensity of stimulation that is possible with a Pivotal platform. To compensate for the limited amplitude possible with Lineal machines the frequency can be increased but there is also a limit to how high you can take the frequency before it becomes ineffective. Whole Body Vibration researchers in Finland1 tested vibration frequencies from 10 to 90Hz and showed that with Lineal Whole Body Vibration, when the frequency goes past 40Hz the amount of vibration energy transferred to the body decreases by a factor of between 10 and 1,000 depending on the frequency and the body part being tested. If the frequency is too high with a Lineal platform the body may not have an opportunity to drop down before the platform rises up again - it would be as if the body was hovering in the air, no longer moving up and down the full distance that the platform moves up and down. Less body movement means less muscle stretching which means less muscle activity. When you consider that Lineal machines have a small amplitude to begin with, it would not take much to reduce the muscle activity to zero if the platform was moving too fast to allow a full up and down movement of the body. This is supported by anecdotal reports that "the muscle stimulation suddenly stopped" when the frequency approaches 50Hz and is something you can easily test for yourself. In fact some Lineal manufacturers have decided to stop making machines that are capable of vibrating at 50Hz stating that "the body doesn't respond to frequencies that fast." Try it and see for yourself. There have been few occasions where a Lineal and Pivotal machine were compared in the same study using the same settings. In each case however the results appear to be the same - Pivotal produces greater muscle activation and less head vibration. "[Muscle] responses were significantly greater during rotational vibration (Pivotal) than vertical vibration (Lineal)." "Neuromuscular activity during SV (Pivotal) was enhanced compared to SyV (Lineal)"
The following graph shows these results with the dark bars being Pivotal and the hollow bars being Lineal. The higher the bar, the greater the amount of muscle activity. Pivotal produced on average 133% more muscle activity. Kiiski J., 'Transmission of Vertical Whole Body Vibration to the Human Body' J Bone Miner Res. 2008 Aug;23(8):1318-25. Abercromby A., 'Vibration Exposure and Biodynamic Responses During Whole Body Vibration Training' Med Sci Sports Exerc. 2007 Oct;39(10):1794-800. Abercromby A., 'Variation in Neuromuscular Responses during Acute Whole-Body Vibration Exercise' Med Sci Sports Exerc. 2007 Sep;39(9):1642-50. Ritzman R,. 'The influence of vibration type, frequency, body position and additional load on the neuromuscular activity during whole body vibration' Eur J Appl Physiol. 2013 Jan;113(1):1-11.